Here are three key macro factors that I have been watching now for clues to the direction of the stock market and sector selection. Mid-week market update: In the wake of Federal Reserve vice chair Stanley Fischer's remarks about Friday's Job Report, the market is mainly playing a waiting game for the results of that announcement. However, there are signs that the Jobs Report may be setting up for a negative surprise which could be bullish for bond and equity prices and bearish for the USD. How bad could a Chinese debt crisis get? In my last post (see The roadmap to a 2017 market top) I wrote that one possible bear market trigger would be a debt crisis in China. In response, an alert reader sent me this Bloomberg tweet and asked for my comment. How bad could a China debt crisis get? In this post, I try to model the global effects of a China hard landing. I don't want anyone to get the idea that I am a permabull. 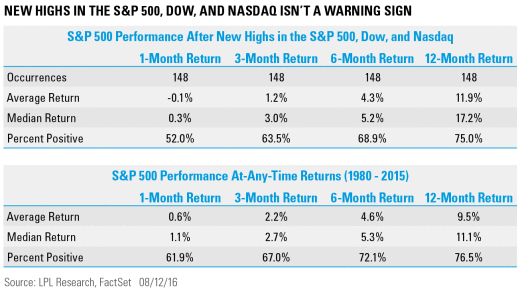 I have been steadfastly bullish on stocks for all of 2016. 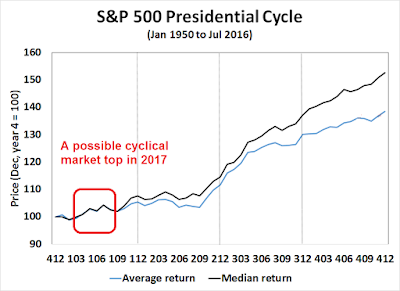 This may be the time to sound a cautionary note by outlining a scenario of how stock prices could make a cyclical top next year. 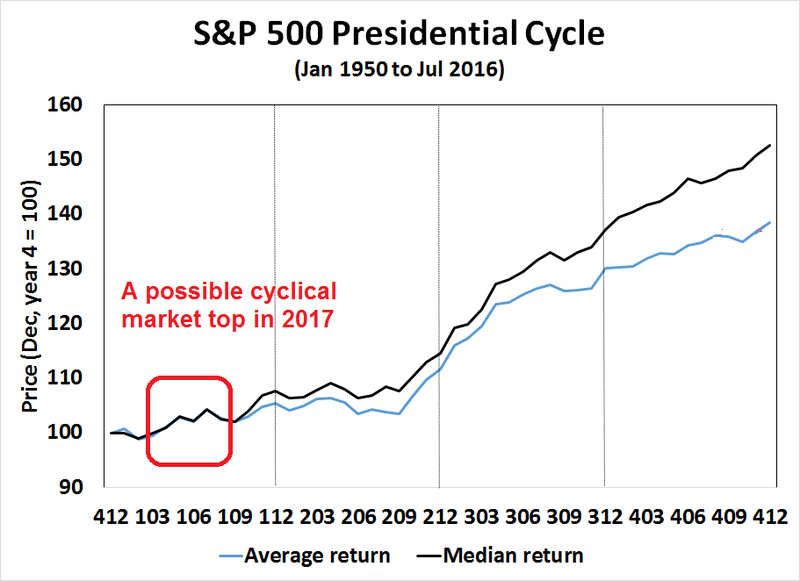 The chart below shows how the stock market behaves during the four-year presidential cycle. The black line shows the pattern based on past monthly median returns and the blue line shows the pattern based on average monthly returns. Statistically, median returns (black line) are better representations than average returns (blue line) because averages can be distorted by large outliers, such as the Crash of 2008. The bearish headwinds that could lead to the formation of the market peak. Showdown at Jackson Hole? Forget it! The markets have been nervous as we await Janet Yellen's speech at Jackson Hole. Now that the agenda for the Jackson Hole symposium has been released, I believe that Yellen is unlikely to announce any major shift in monetary policy in her speech. The intent of the Jackson Hole symposium is for Federal Reserve officials to think long term. The intent isn't to make a decision on whether to raise interest rates in September, December, or next year. Instead, the purpose of the meeting is to think about different frameworks for Fed officials to do their job. Possible topics include the conduct of monetary policy and their mechanisms, financial regulation, and so on. Mid-week market update: On the weekend (see The market's hidden message for the economy, rates and stock prices), I wrote that the short-term outlook was more difficult to call than usual. 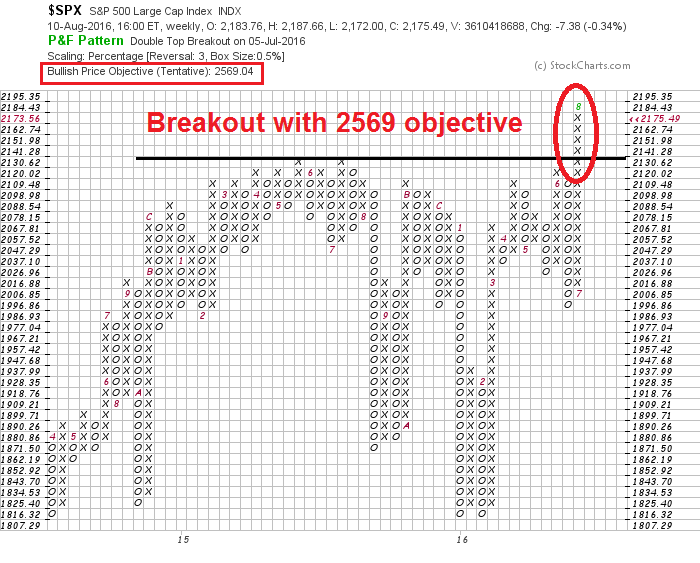 On one hand, we were seeing broad based strength, which argued for an intermediate term bullish call. On the other hand, Urban Carmel pointed out that the market has a tendency to pause when it nears a round number. 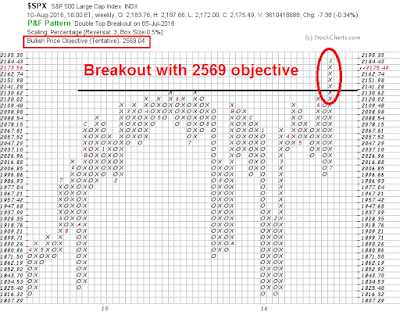 In this case, the hurdle is 2200 on SPX. I would caution that this is purely a tactical call of a short-term SPX correction of no more than 3-5%. As I wrote two weeks ago: Be patient, it's hard to argue against the intermediate term bullish trend. About three weeks ago, I wrote about opportunities in European equities (see Worried about US equities? Here's an alternative!). I pointed out that stock prices in Europe were far cheaper than US, the fears about European integrity and financial system were overblown, and the market seemed to be ignoring signs of a growth recovery. Since then, the FTSE 100 has moved to new recovery highs since the Brexit vote. The Euro STOXX 50 has rallied through a downtrend resistance level and it's has retreated to test support. American investors can see a similar pattern on the USD denominated ETF (FEZ). If you missed the first opportunity to buy into Europe, this may be your second chance. I have always believed in listening to the markets. Technical analysis is useful as it can be a way of discerning the market's hidden message, especially when performing inter-market analysis, otherwise known as cross-asset analysis. I have found point and figure charts to be particularly useful tools because they filter out a lot of the price noise, especially when markets trade sideways in a tight range as they have recently. 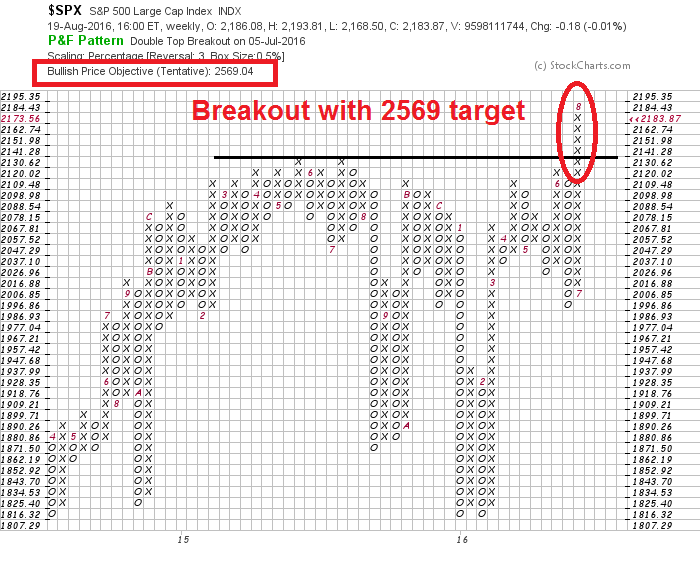 As an example, my recent post that featured a SPX weekly point and figure chart got a lot of attention (see Be patient). Since I performed that analysis, not much has changed. The latest weekly chart pattern remains unambiguously bullish on an intermediate term basis. It also tells the bullish story of powerful price momentum, TINA (There Is No Alternative) and FOMO (Fear Of Missing Out), all rolled into one. I reviewed my charts using this technique in order to get a fresh point of view and what I found astonished me. Over and over again, I was getting a lot of chart patterns like this from a single market sector. Bullish or bearish? The charted instrument is in a well-defined uptrend, but there is overhead resistance nearby. While I interpreted it bullishly, I wanted to be sure. A Twitter poll showed that the crowd agreed with me. This results of this analytical approach was in effect a hidden message from Mr. Market. More importantly, the message has crucial medium term implications for the economy, interest rates, stock prices, and the likely trajectory of Fed policy. Mid-week market update: The intermediate term outlook that I've been writing about for the past few weeks hasn't really changed (see Get ready for the melt-up and Party like it's 1999, or 1995?). The stock market continues to enjoy a tailwind based on the combination of overly defensive investors and a growth turnaround which is leading to a buying stampede. 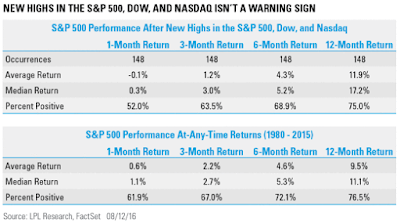 The Dow, SPX and NASDAQ made simultaneous new all-time highs (ATHs) on Friday, August 5, 2016 and repeated that feat again this week on Monday, August 15, 2016. Ryan Detrick of LPL Research pointed out that such events tend to be bullish. The chart below shows past instances of simultaneous new highs. The table below details stock market performance after such events. Current circumstances are consistent with my buying stampede thesis. However, it is not at all unusual for stock prices to trade sideways after breakouts to ATHs. As long as the consolidation action is benign, the path of least resistance is up. The minor market weakness in the last couple of days is also consistent with my view of sideways consolidation. As we await the Fed`s annual Jackson Hole symposium on August 25-27, Bloomberg highlighted a research paper by Fed economist Jeremy Nalewaik. 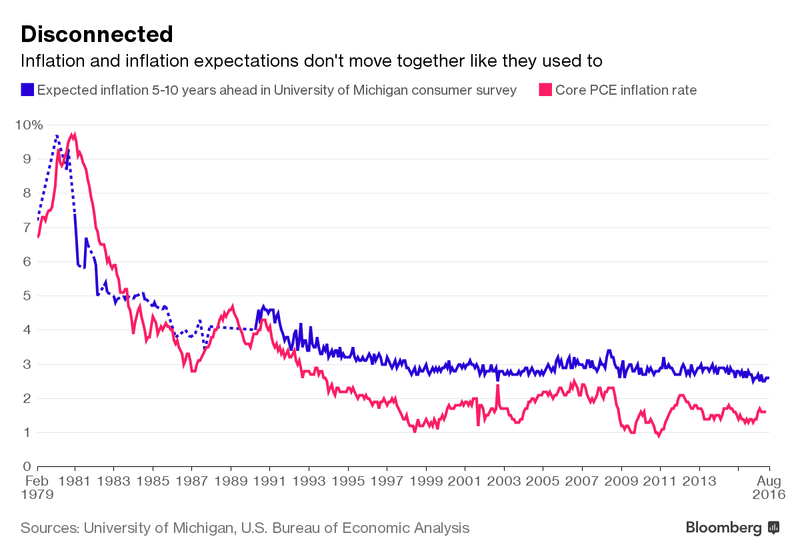 Nalewaik found that inflation and inflationary expectations had tracked each other well but started to diverge in the mid 1990's. 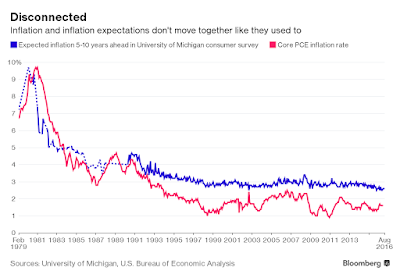 “Movements in inflation expectations now appear inconsequential since they no longer have any predictive content for subsequent inflation realizations,” Nalewaik wrote. Akerlof’s and Nalewaik’s research jibe nicely with ideas that St. Louis Fed President James Bullard has injected into the debate on the rate-setting Federal Open Market Committee this year. If this paper becomes a major focus at the Jackson Hole meeting, then the Fed is likely to tilt towards a take-it-slow view on raising interest rates. However, I would argue that this analytical framework is highly sensitive to how the Fed picks its input variables. One wrong move could result in a policy error of major proportions. Party like it's 1999, or 1995? How close are we to a market top? I am used to getting abused for my market views, but the abuse is starting to turn into agreement - and that's a cautionary flag. I haven't always been a bull, here is a summary of my major market calls since January 2015. When I was cautious in the first half of 2015, I got hate mail (see Why I am bearish (and what would change my mind)). When the market corrected in August/September 2015 and I was constructive on stocks, I got hate mail (see Relax, have a glass of wine and Why this is not the start of a bear market). When I turned bullish in January 2016 at the height of the market panic, a lot of people thought I was an idiot (see Buy! Blood is in the Streets). When I reiterated my bullish views as the market moved sideways in June before the big breakout, there was much skepticism that stock prices could go much higher (see How the SPX can get to 2200 and beyond). 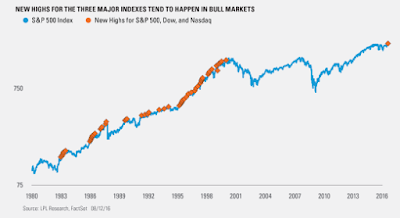 Now that the broad market averages are seeing new all-time highs, market psychology has shifted from skepticism to grudging acceptance of the bull case. This got me worried. Am I becoming consensus and part of the crowd? Does this mean that the market is about top out? For some perspective on this question, the Dow, SPX and NASDAQ all made simultaneous new highs last Thursday. 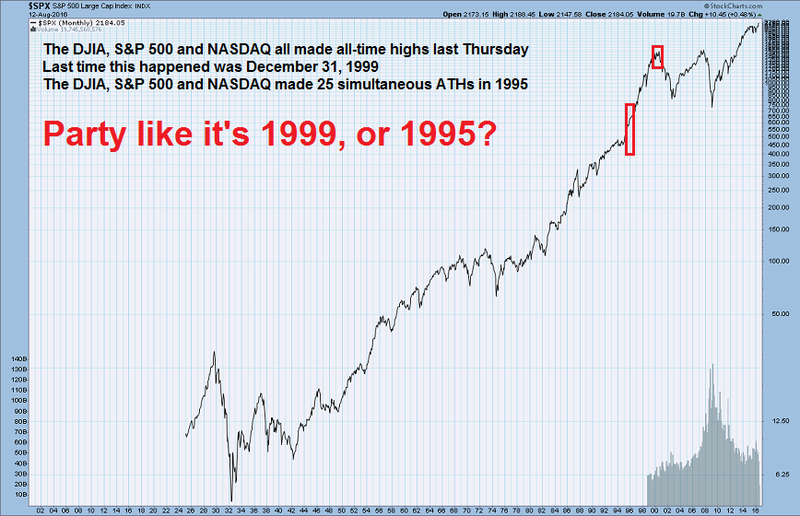 The last time this happened was December 31, 1999, which was shortly before the ultimate top in March 2000, indicating that the market may be in a high risk zone. On the other hand, Ryan Detrick highlighted analysis showing simultaneous new highs in all three indices tend to be bullish. 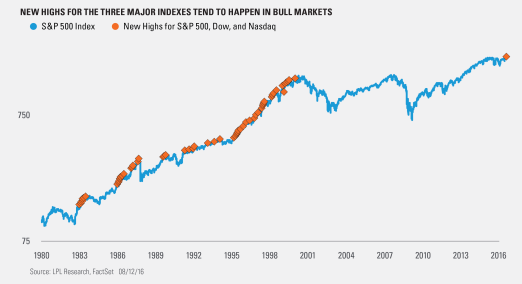 Coincidental new highs is reflective of bullish price momentum, Detrick pointed out that the market saw a total of 25 simultaneous new highs in 1995. 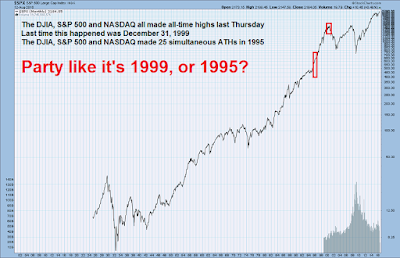 So should we party like it's 1995, which was a sustained bull move, or late 1999, which marked a blow-off top? I believe that the answer depends on the timing of a recession caused bear market, which is a function of the Federal Reserve's reaction to economic and market developments. Mid-week market update: Is this the pullback and correction that I've been anticipating? If so, how far can it go? Take a look at this weekly point and figure SPX chart. 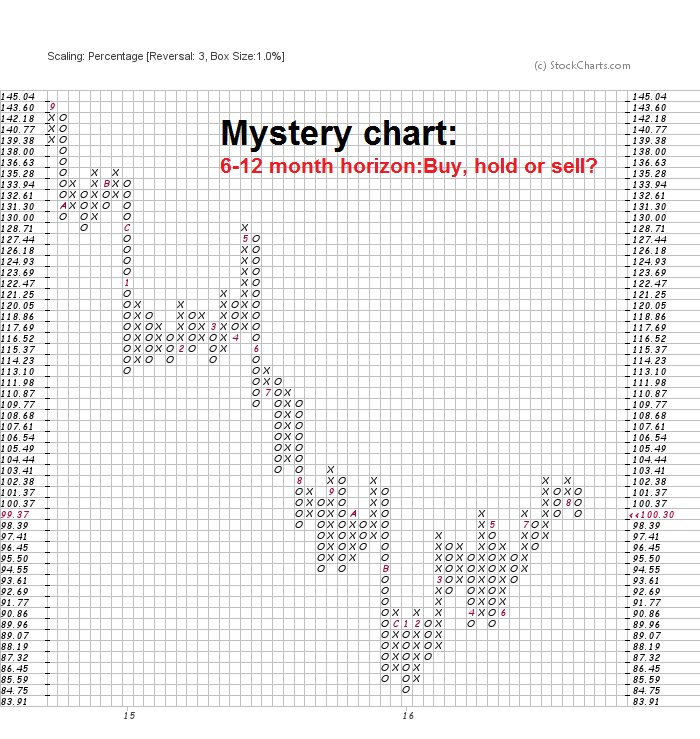 Is there any doubt that the intermediate term outlook is bullish? While my inner investor remains bullish based on the intermediate term trend, my inner trader is cautiously bullish and not all-in as there may be some near-term choppiness ahead. I am seeing an unusual level of rising anxiety over the political implications of Brexit. Last week, Stratfor published a report entitled "Brexit: The First of Many Referendum Threats to the EU", which detailed the threats of additional referendums to the future of Europe. Are we at a point right now where it feels like it’s accelerating. People all over are very unhappy about what’s going on. If you read history, there are a lot of similarities between now and the 1920s and ’30s. That’s when fascism and communism broke out in much of the world. And a lot of the same issues are popping up again. The European Union as we know it is not going to survive. Not as we know it. Britain voted to leave, and France could very well be next. Why France? One of the main reasons is because the French economy is softer than the German economy. At least in Germany people are still earning money and making a living, despite all the recent turmoil. In France, the same malaise that’s settling over the U.S. and other places is settling in. And it’s going to spread. There is no place to hide with what’s coming. I’m not saying it’s coming this year, or even the next. I can’t give a specific date. But imbalances are building up to such a degree, they just can’t continue much longer. In addition, Philippe Legrain fretted about Brexit opening the door to European disintegration in an essay in Project Syndicate. I beg to differ. In fact, the Brexit experience has made Europe stronger, not weaker. The SPX broke out to another all-time high on Friday in response to the positive surprise from the Employment Report. The upside breakout followed a false breakdown out of a narrow trading during the same week. 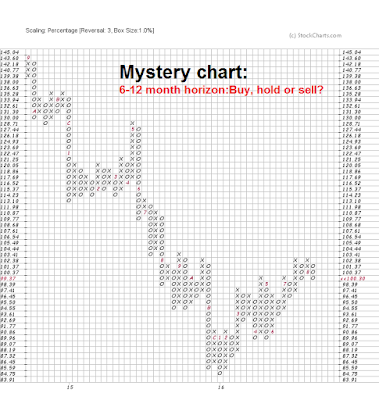 The key question for traders is, "Is this an honest-to-goodness breakout, or just a fake out?" Indeed, there is an intermediate term bullish case to be made. 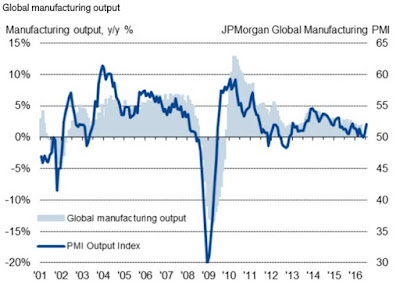 I've been writing for the past few weeks about how the combination of overly defensively oriented investors and a US growth surprise is leading to a FOMO (Fear of Missing Out) rally in US equities. Now it seems that the growth surprise is spreading around the world. As the chart below shows, the Global Purchasing Managers Index (PMI) is turning up, which is a positive sign for global growth. On the other hand, short-term technical indicators are flashing signals of extreme caution. The market appears to gotten ahead of itself and a pullback may be in order before stock prices can rise sustainably. The chart below from Sentiment Trader shows that sentiment is at an optimistic extreme, which is a worrisome sign (annotations in red are mine). 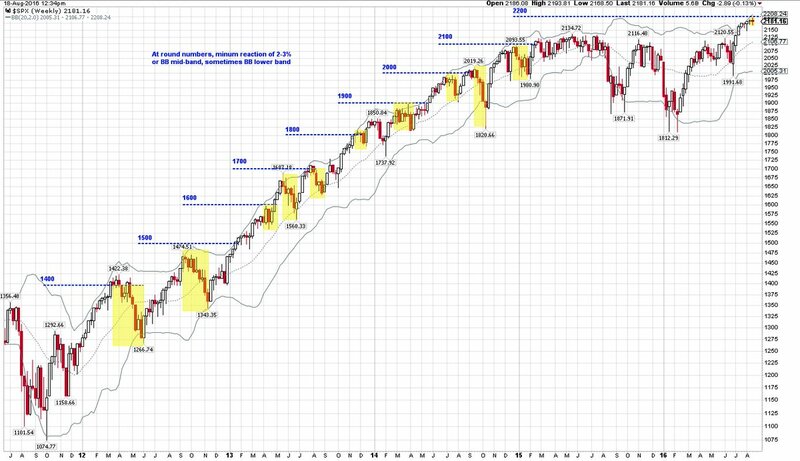 Mid-week market update: After spending over two weeks in a narrow trading range, the SPX broke down out of that range yesterday and tested technical support at the 20 day moving average (dma), which was also the mid-Bollinger Band mark. 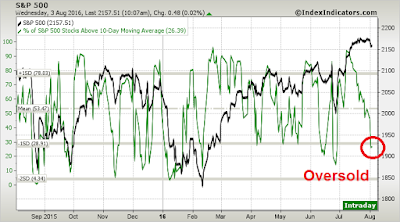 At the height of the decline, the index had fallen 1% and the market was flashing short-term oversold signals. 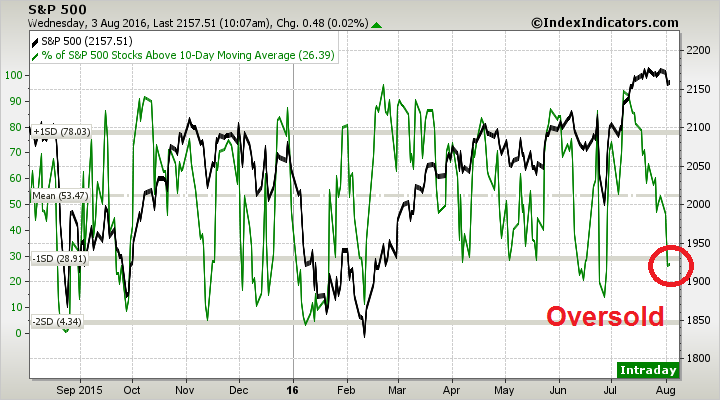 In addition, short-term breadth measures (via IndexIndicators) had retreated to oversold levels that a bounce was likely. Those conclusions are based on the combination of an intermediate term backdrop of economic and fundamental growth and powerful price momentum. Under such circumstances, market pullbacks are likely to be shallow and further all-time highs would probably follow soon afterwards. Let me expand on those points. Worried about US equities? Here's an alternative! I have a suggestion for value oriented investors who are uncomfortable with my market blow-off thesis for US equities (see How to get in on the ground floor of a market bubble and Get ready for the melt-up). What about buying Europe? 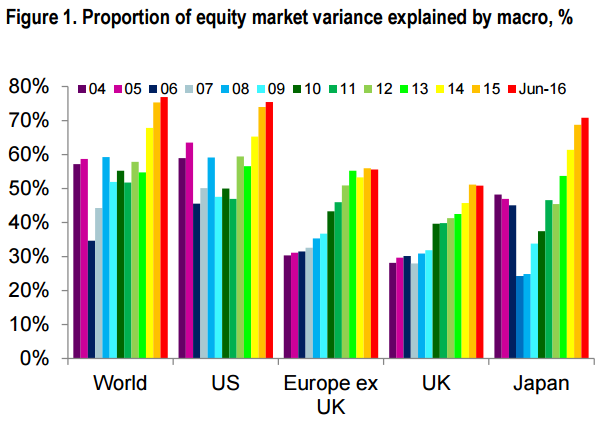 Valuation metrics for European stocks are certainly cheaper. The SP 500 trades at a price to book ratio of 2.7 and forward P/E 18.4. By contrast, FTSE Europe trades at a P/B of 1.6 and forward P/E of 15.9 and the Euro Stoxx 50 trades at a P/B of 1.3 and forward P/E of 13.5.